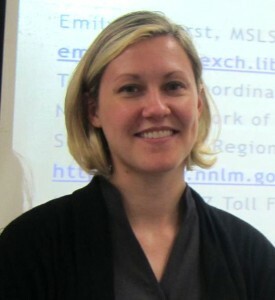 Emily J. Hurst, MSLS | Medical Librarian. Type 1 Diabetes. Medical Librarian. Type 1 Diabetes. I currently serve as the Head of Research and Education at VCU’s Tompkins-McCaw Library for the Health Sciences. This is a new job and a return to academic medical librarianship for me. I look forward to leading a team of outstanding medical librarians in their efforts to support the research needs and improve educational standards among health professionals, students, and faculty in Virginia Commonwealth University’s growing Medical Center. I previously worked as the Technology Coordinator for the National Network of Libraries of Medicine, South Central Region (NN/LM SCR). In this position I provided information for Network members about integrating the latest technology into their library. I also designed and taught a variety of classes about new technologies. I traveled and taught throughout the five states of the South Central Region and beyond. I also provided instruction in online formats using Moodle. I have been an invited speaker at the American Library Association, the Medical Library Association, Internet Librarian as well as other smaller meetings and conferences. In 2011 I took part in the Biomedical Informatics course offered by the National Library of Medicine. I have also been honored as an emerging leader (Rising Star, 2011) by the Medical Library Association and participated in the Texas Library Association’s TALL Texans leadership program in 2014. I have also worked as an Instructional Services librarian at the UT Health Science Center, San Antonio Briscoe Library where I trained university faculty, staff, and students on PubMed and other research resources including EndNote. I also provided reference assistance. In this position I worked within the library to create an inter-departmental technology brown-bag luncheon program where new technologies were explored. I attended graduate school at the University of North Carolina, Chapel Hill where I worked as a graduate assistant at the Health Sciences Library. I also have experience working as a library intern at Rex Healthcare, a hospital in Raleigh, North Carolina. I was diagnosed with type 1 diabetes in 1995 and I was active in the Houston area T1 Diabetes Network (T1DN Houston) where I helped organize social events and speaker dinners for adults with type 1 in the Houston area. I am available for consultations services related to technology education for librarians and health professionals, social media management in libraries, and a variety of other topics.